We have established a testing facility located in our Shenzhen factory to ascertain the thermal performance of our product to meet the STD-201 standard. Analysis can be made by this equipment ,so that product performances can be monitored and controlled. 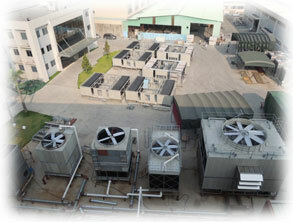 With the aid of this equipment, custom-made cooling tower is available according to the customers’ requirements. In order to study the mechanism of visible plume formation and the characteristics of visible plume phenomenon including the patterns of visible plume under cross wind, the plume contents under various conditions, etc, we cooperated with universities and established an Artificial Environmental Chamber in our factory. Many experiments have been undertaken through this facility, in conjunction with relevant CFD simulations, making it possible to develop the reliable plume abatement approaches.